The most memorable game of the weekend came on Friday, when the Blue Jackets embarrassed the Canadiens in a stunning 10-0 win. That’s a final score that doesn’t even seem possible; if you didn’t watch the game live and just saw the score scroll by on a screen somewhere, you probably assumed it was a typo. But it was real, as much as Habs fans may wish that it was all a mistake. The Montreal Canadiens, who came into the game with a 9-0-1 record and having given up just 13 goals on the entire season, went into Columbus and lost by double digits. And as you might expect, the rest of the hockey world had some fun at their expense. For our purposes, the question becomes whether that one terrible loss should be enough to bump Montreal out of their number one spot in the power rankings. The short answer is no, as you'll see below. And that's especially true when the loss didn't involve Carey Price. We already know that the Habs aren't the same team without their franchise goaltender – last season was one long case study on that particular topic – so we won't overreact to a game that didn't even involve him. But our rankings are meant to be as much about the long-term as right now, meaning they could be read as a projection of which teams are most likely to win a Stanley Cup. If the Habs are still on top, it raises the question: Do Stanley Cup champions ever get crushed like Montreal did on Friday? Yes they do, as it turns out, although it's rare. There have been 18 times in hockey history that a team lost a game by seven goals or more and still went on to win the Cup that season. Six of those predate the Original Six era (three involving the 1917-18 Toronto Arenas). It's happened just nine times since the start of the expansion era in 1967. You have to go back over a decade to find the most recent example. The 2005-06 Hurricanes dropped a 9-0 loss to the Thrashers early in the season. The 1995-96 Avalanche lost 7-0 to the pre-rivalry Red Wings in March of that season, and the 1991-92 Penguins dropped an 8-0 decision to the Capitals just a few weeks into the schedule. And the mighty Islanders dynasty did it twice, losing 8-0 to the Blackhawks in 1979 and 11-4 to the Flames in 1981. 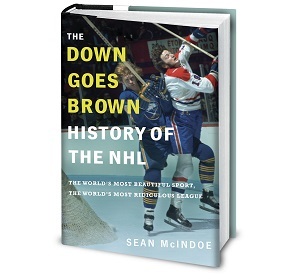 Even better news for the Habs: a 10-0 final wouldn't even be the biggest blowout ever suffered by an eventual champ. The worst losses by a Cup winner were a pair of 11-0 decisions, one by the 1963-64 Maple Leafs at the hands of the Bruins, and one by the 1983-84 Oilers at the hands of the Whalers. Amazingly, that Oilers loss came just one week after a 9-2 loss to the Capitals. 5. Washington Capitals (8-2-1, +10 true goals differential*) – The defending Presidents' Trophy champs have now won five straight, although all five of those have come against teams that have lost more than they've won. 4. Chicago Blackhawks (9-3-1, +14) – After a shaky start, they're sitting on top of the Western Conference standings. And maybe more importantly, they've made progress on the penalty kill, allowing just one power play goal in their past five games.